The large quantities of viral macromolecules and virus particles that are produced in an infected cell impose heavy demands on the host. Synthesis of the building blocks of a virus particle – nucleotides, amino acids, and sometimes fatty acids – requires energy, typically in the form of ATP. Synthesis of viral proteins and genomes, and transport of viral components in the cell also require energy. Because of these needs, viral infections often lead to alterations in the energy-generating and precursor synthesizing pathways of a cell. Two recent examples illustrate how virus infection can alter host metabolism. The first study shows how a long non-coding RNA (lncRNA) induced by viral infection binds a metabolic enzyme and enhances its catalytic activity. There are thousands of lncRNAs encoded in the mammalian genome which appear to regulate gene expression. An lncRNA called lncRNA-ACOD1 is induced in cells infected with a variety of viruses. Removal of the gene for lncRNA-ACOD1 from cells or from mice significantly reduces viral replication. The positive effect of lncRNA-ACOD1 on viral replication is a consequence of the binding of this RNA to glutamic-oxaloacetic transaminase, an enzyme that participates in multiple metabolic processes. Binding of lncRNA-ACOD1 increases activity of the enzyme and leads to the production of metabolites that facilitate viral reproduction. Perhaps even more amazing is that the increased synthesis of lncRNA-ACOD1 in virus infected cells depends on the activation of nuclear factor kappaB, a transcription factor which regulates metabolism and response to infections. A subunit of NF-kappaB binds the promoter of the gene encoding lncRNA-ACOD1, increasing its synthesis. Virus evolution has turned a cellular defense into a positive regulator of virus replication! Another example of metabolic manipulation in virus infected cells comes from the study of a plant virus, tomato bushy stunt virus. This RNA virus replicates to very high levels in a short time, requiring a great deal of ATP. This energy requirement appears to be partially satisfied by the recruitment into the replication compartments – vesicle-like structures that are formed during viral replication – of the enzyme pyruvate kinase. 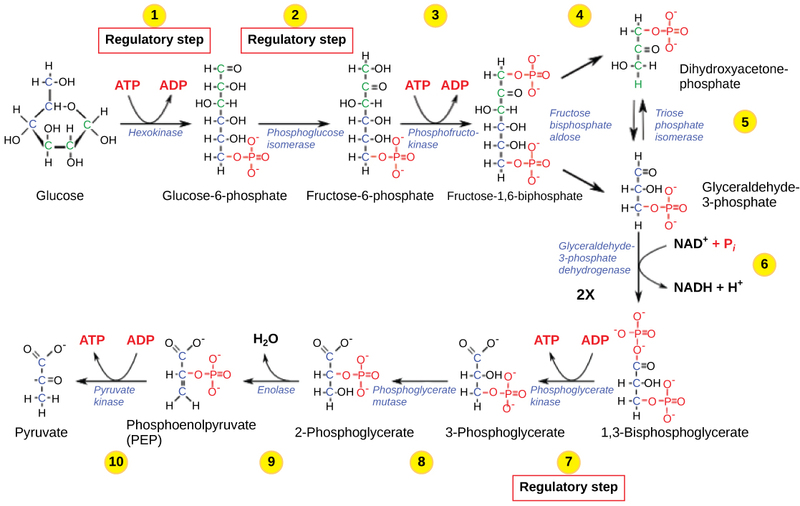 Pyruvate kinase catalyzes the last step of glycolysis, the production of pyruvate and ATP from glucose (step 10 in the image – you do remember your metabolism, right?). 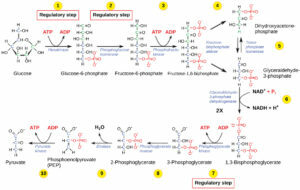 Glycolysis is a major metabolic pathway in the cytoplasm which not only produces ATP, but also metabolites for biosynthetic pathways such as the synthesis of lipids, amino acids, and nucleic acids. Pyruvate kinase is recruited into TBSV replication complexes because it binds the viral RNA-dependent RNA polymerase. There it synthesizes high levels of ATP which is used for the activity of helicases – also recruited from the host cell – needed for the production of large amounts of positive-strand genomic viral RNAs. These are just two examples of how virus infection remodels the metabolic profile of the cell. There are other fascinating examples, some of which are apparently unique. One is the synthesis of the fatty acid palmitate for its subsequent oxidation in cells infected with poxviruses. Another is the induction of autophagy in dengue virus infected cells, which leads to mobilization of lipid stores. Additional examples of the ways that viral gene products regulate or redirect cellular processes surely remain to be discovered.